The Porsche Experience Center in Los Angeles, also shown below right, opened in November 2016. The L.A. center and another one in Atlanta provide training facilities for Porsche employees. Exciting customers is about to become more than a mission statement at Porsche Cars North America. The theme will govern a new program to train 5,200 people employed at Porsche’s U.S. dealerships beginning later in 2017. As part of the program, which is dubbed Excite, Porsche last month selected the Disney Institute to help it fine-tune plans and carry out the training. 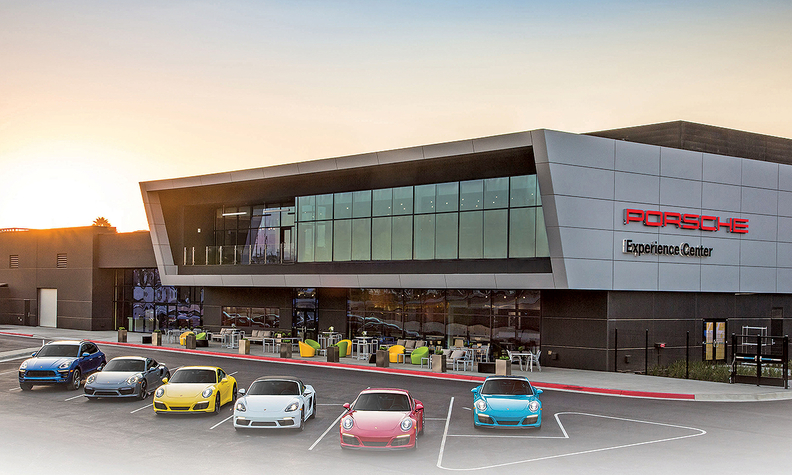 The effort likely will bring all customer-facing dealership personnel to one of the brand’s two U.S. Porsche Experience Centers. As another step in this long-term initiative to improve the customer experience, Porsche also is asking dealers to designate a customer experience manager in their stores. For many dealerships, that is likely to be a new, stand-alone position. Though many dealers are wary about increased costs for both the training and the new management position, the dealer body is generally on board with the initiative. The aim is to increase brand loyalty among Porsche customers and ease their interactions at Porsche’s 189 U.S. dealerships, said Klaus Zellmer, CEO of Porsche Cars North America. Both Zellmer and his predecessor, Detlev von Platen, now Porsche’s global sales chief, have called for Porsche and its dealers to improve the brand’s customer satisfaction performance. Porsche has lagged in some J.D. Power rankings over the years, though it is improving. Hitting the top of such rankings across the board will require a cultural shift both at the corporate and retail level, von Platen said. Excite is being piloted in the U.S. market and will eventually go global, von Platen said. Porsche isn’t sharing a dollar estimate on the cost, but he said the company and dealers will share in the expense. Dealers are expressing cautious optimism, though they don’t yet know the specifics of the coming requirements. Training excursions to the centers in Atlanta and Los Angeles may also help cut down on more expensive travel to Europe for dealership managers, said Blue, who is also a member of the Porsche Dealer Board of Regents. Still, Porsche must take care not to overly burden dealerships and hurt profitability. Mike Sullivan, owner of the LAcarGuy group of dealerships in Southern California, is cautiously optimistic. He has experienced Disney training with another manufacturer and praised it for driving home the message that every employee delivers a guest experience. The training must be designed so that champions can bring it back and build a culture in the store. Do technicians need to go to the offsite training? Maybe not, Sullivan said. Those details will get ironed out in the next couple months. In May, Porsche executives will visit four cities in the U.S. to host dealer workshops looking at how the brand designs the customer experience program. Excite execution will roll out in the second half of the year, he said. A major part of the initiative is building the customer experience manager position. After piloting the role last year, nearly 70 U.S. Porsche dealerships have added the position, Zellmer said. “We need someone who’s part of the management team at the point of sale to remind everybody about customer processes: Where do we fulfill? Where do we exceed customer expectations? Where do we fall short and what are we doing to make up for that?” Zellmer said. Sullivan has added two customer experience managers at his Porsche South Bay store in Hawthorne, California, and has become a believer in the position. “I fought hiring two extra people that weren’t income-producing,” he recalled. But they’ve become a real asset, he said. Sullivan operates a big new store with several old racecars on display, and a lot of visitors stop by just to look. A stroll through the store with the experience manager is not designed to be a sales pitch, but it has become such a pleasant tour that many visitors ultimately make purchase inquiries, he said. The experience manager also helps existing customers tackle service problems, set up vehicle pickups or deliveries, or even drop-offs at the airport, he said. Such experiences ultimately are intended to help improve Porsche’s results in third-party customer satisfaction rankings. That was a key priority for von Platen when he ran the U.S. business. In early 2015, he told dealers he wasn’t happy with Porsche’s standing in such surveys as the J.D. Power Customer Service Index. Porsche was ninth among luxury brands that year. Zellmer has echoed that call to action since becoming head of the U.S. business in late 2015. “We still have a whole lot of work to do when it comes to the service program,” he said earlier this year. But it’s starting to pay off. This month, Porsche’s ranking in that CSI survey jumped to fourth among luxury brands. Porsche’s standings in the current round of J.D. Power surveys are its best results in the brand’s U.S. history, a company official said. While Zellmer praised dealers for their training effort for technicians and service advisers last year, he made clear that the job isn’t done. Porsche currently is ranked first in three of five key J.D. Power measures. It is tops in the sales satisfaction, vehicle dependability and APEAL or Automotive Performance, Execution and Layout rankings, No. 2 in initial quality and now No. 4 in the Customer Service Index. Zellmer’s sights are now set on the final two.